If you are a fan of bridges, the following two famous bridges should be part of your itinerary. An option would be to include the visit with a day trip to Ella. The Bogoda wooden bridge was built in the 16th century during the Dambadeniya era. This is said to be the oldest surviving wooden bridge in the world. The bridge is situated at 13 km south of Badulla city, Sri Lanka. All parts of this bridge were constructed from wood, including the use of wooden nails as fixing material. The roof tiles of the bridge show the influence of Kingdom of Kandy. The bridge was built across the Gallanda Oya, which linked Badulla and Kandy ancient route. The Bogoda bridge is over 400 years old and made entirely from wooden planks, which are said to have come from one tree. The bridge is an exclusive construction as it has an 8 feet tall tiled roof structure for its entire span of nearly 50 feet length with a 6 feet breadth. Wooden fences of the bridge was decorated in various ancient designs, have been erected on either sides. The structure of the bridge is standing on a huge tree trunk 35 ft in height. Jack fruit (Artocarpus heterophyllus) logs and Kumbuk (Terminalia arjuna) logs were mainly used as the constructive material of the bridge. Furthermore Kaluwara (Diospyros ebenum) timber and Milla timber were used for the wooden decorations. Bogoda Buddhist temple is an ancient temple situated beside the Bogoda wooden bridge. The temple has much longer history than the bridge. It is from the 1st century BC, during the period of Anuradhapura era. The temple was built by King Valagamba. Stone inscription by the temple in Brahmin scripture says the temple was donated to a priest called Brahmadatta by Tissa, a provincial leader in Badulla. Inside of the temple were elaborated with lovely paintings,bearing resemblance to the Kandyan era. The walls were built with a paste made of cotton wool, bees honey and extracted and purified white clay. The paintings were drawn on these walls. 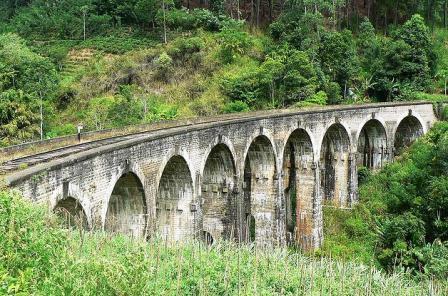 The magnificent Nine Arch Bridge between Ella and Demodara stations are just a few kilometres along the track from the Demodara station. This bridge, which is nearly 100 years old, has been built with blocks of stone and cement without any reinforcing iron or concrete. The tall arches take the bridge on a semi circular path to connect to mountains. The hill country railway line is one of the most picturesque in the region, winding through tea estates, pine forests and misty peaks, passing along the way waterfalls and heart wrenching precipices. Adding to this natural beauty are the man-made engineering feats found along the way. Many of these structures date back to the British era, when the track was originally built. At Demodara the surveyors discovered that the elevation of the hills was too great for the track to negotiate. With the maximum inclination allowed in railways at that time being one foot per 44 feet, an innovative track design had to be devised. Situated 172 miles from Colombo, Demodara has joined railway legend for its fascinating loop. First conceptualised by Sri Lankan engineer, D.J. Nimalasurendra the design is called “Looping the loop”. This involves a tunnel which actually runs beneath the Demodara railway station. On the track which exists, the tunnel winds around a mountain, continuously ascending to end up at a higher elevation on what was the mountain under which the tunnel is built. This enabled the engineers to take the railway track to a higher elevation as required for it to reach the height at which it can ascend to the Central Hills, while at the same time keeping to the gradient stipulated by the standards. It is easy to imagine this stretch of railway at Demodra if one can visualise a ribbon that is worn for AIDS or Breast Cancer awareness. Similarly the track crosses itself, only at two elevations. The tunnel therefore, which is 320 metres long, is situated underneath the Demodara railway station.